Best Play Pro Yakyuu (ベストプレープロ野球, Best Play Pro Yakyuu? lit. 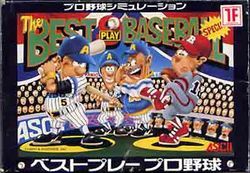 Best Play Pro Baseball) is a baseball game developed by ASCII Entertainment for the Famicom, and published in Japan in 1988. It is the first game in the Best Play Pro Yakyuu series. Unlike similar baseball games developed for the Famicom, this game has a particular emphasis on baseball management simulation, as opposed to focusing on the skill of playing baseball. As a result, players do not actually hit, pitch, or field the ball. Rather, their interaction in the game is accomplished by changing lineups and alternating pitchers and fielders in order to give your team the best chance it has in winning a league pennant race. An updated version of the game (referred to as "Shin Data") was published on October 11, 1988, which contained updated information about each team's players. Both versions of the game were only released in Japan, and have never been translated from the original Japanese. This page was last edited on 20 October 2014, at 14:56.